There is so much stuff just around the corner! The sun has finally come out, the ice has almost completely melted, and we are getting excited for what summer brings! There are a bunch of great events around the corner like Trondheim Vegan Fair, Green Food Fest, and of course Oslo Vegetarfestival. We will be at Oslo Vegetarfestival this year selling delicious cookies to raise money for Norway's biggest animal sanctuary: Dale Store Gård. Please do go along and support your local vegan fair. The people running these events put so much work into making them happen, and the businesses involved are usually local vendors. Check our events listing on facebook to keep up to date with all the vegan stuff happening near you. Anyway, we thought we would let you know about some of the new places we have added to the app in the past few weeks so you can get inspired of the nice spots you can visit with your friends this summer. We love stuffed bao buns, and here at Bā-Gā they take this dish one step further by turning them into full-on bao burgers, or baogers! They have a vegan baoger on the menu with tofu in delicious korean BBQ sauce and cucumber and kimchi, all in a soft delicious bao bun, and comes for 89,- kr. There are plenty of vegan sides to go with your baoger, including the Pimientos de padron, 75-kr, grilled fresh baby bell peppers topped with salt flakes, monsun kim-chi pickles, 45,-kr, spicy julienne radish, carrot and leek, and the cucumber pickles, 30,-kr, cucumber slices in sesame and dry chilli. Matmagasinet is a lovely place to meet a friend for coffee and a bite to eat. Pop in for lunch and order a lovely vegan wrap filled with hummus, avocado, grilled veggies and kale for 135,-. If you get there after 12pm you can our fave dish: a vegan pizza topped with hummus, spinach, tomato, portobello, olives, artichokes, avocado, and basil for 185,-. There's also a 'super salad' on the menu for 179,- with quinoa, edamame beans, kale, avocado, apples blueberries, walnuts, and a vinaigrette dressing. The soup of the day is sometimes vegan too! One of our fave places to get lunch when we are out In the city is No Concept Baguettes. There is an amazing vegan baguette on the menu, it’s a huge baguette of rustic crunchy bread and it’s jam packed with veggies, sun dried tomato, potato wedges, garlic sauce and cilantro chutney. It’s such good value for money at only 70;- Wash it down with their orange sensation smoothie (only 35;-) which is mango, carrots, turmeric, ginger, carrot, pineapple, and coconut milk! The guy who runs this place is so nice and friendly, just tell him you are vegan and he will be happy to help you out. Kafe Chaos is a hidden gem in the heart of Bergen. It's a great option for lunch; they have vegan cheese and ham toastie on the menu (59;- for single / 79;- for double) They sometimes have vegan soups, and specials, and if you are looking for something sweet check out their cakes because they sometimes have vegan donuts too! La Border is a great place to go to when you are really hungry! 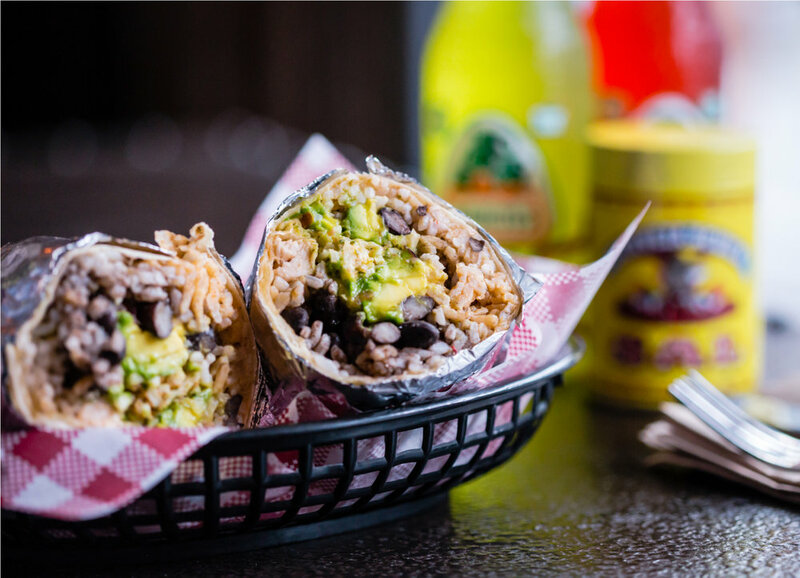 The veggie burrito with chili marinated sweet potato (119;-) is veganisable if you ask for it without cream. It's really great value for the size of the burrito and all the ingredients taste super fresh. They also have vegan churros here too! The mini churros are topped with sugar and are totally delicious. Find hundreds more vegan friendly places (now with fancy pictures) in the Vegan Norway app! Newer PostOh Oslo, we love you.